Information is power, so they say. So it follows that good accurate information on public transport services is needed to make the most of them. Back in 2005, before the first wave of Real smartphones prompted by the iPhone, Google launched Google Transit. The idea is simple: with access to all of a region’s public transport timetables, people can easily find out how they get from A to B — as easily as they can plan a trip on foot or in a car. Metlink also did a substantial amount of work to get the data together to make those Journey Planners work — in an environment with numerous small bus operators, for instance, some of the minutiae of minor bus services was actually known to very few people, and not very well documented! Despite quite a clunky user interface, the Journey Planner more-or-less works most of the time. It had some pretty weird results early on, but these were mostly problems with the data rather than the software. But it has bugs — recently using it, it was telling me it couldn’t work out a trip for me, but then did so anyway — and none of the maps I clicked to display would work. The Victorian authorities have dipped their toes into the area of publishing the timetable data. Back in 2009 it was published as part of a Victorian Government initiative called App My State. 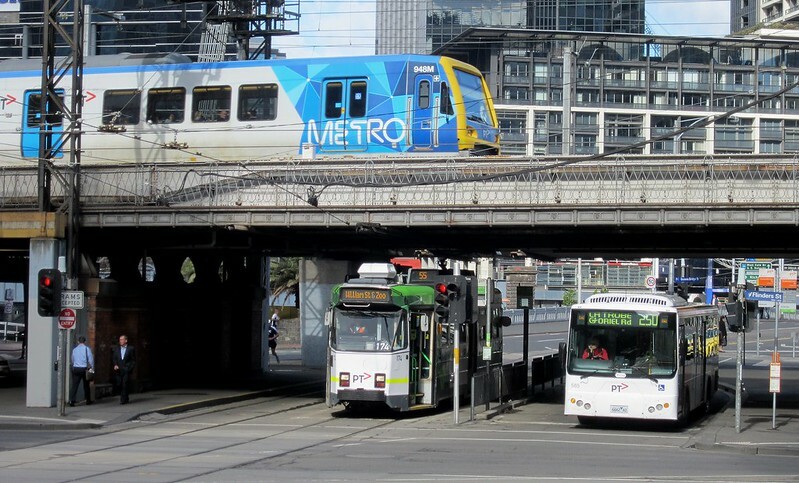 The PTUA used the data in a 2010 study to prove that buses didn’t connect very well with trains (with a web-based App to fulfil the conditions of the data’s use). I think that put a few noses out of joint, and that data set was pulled offline and never updated. Then last year PTV published an API (that’s Application Programming Interface to non-geeks) to look up bits of the data. But the nature of the API is you can only see a little bit of data at a time. It’s what’s used by the official Journey Planner, but ties developers to a specific method of access. The official journey planner, or indeed any online journey planner worth its salt is often easier than ringing up to ask for advice, and easier than wrestling with dozens of printed timetables and a Melway (which is what I used to do). But they’re all clunkier than Google’s offering, which started as a super-smooth desktop web site, and has morphed into a super-smooth experience on phones and tablet devices — and is built into many devices, making it very handy for visitors. The pressure has been on the Victorian government to release data in the open GTFS format (which Google Transit accepts) for years. (My notes indicate I raised it with Metlink as early as 2008.) 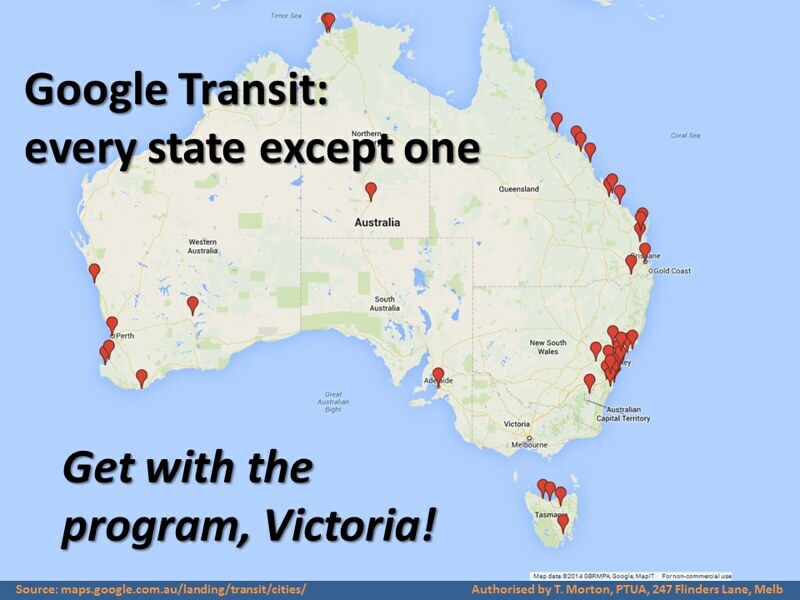 Every other state has already done it, with Google Transit covering numerous cities around Australia. Now, announced via a post on Reddit on Monday afternoon, they’ve finally done it. Apart from enabling Google Transit, because it’s an open format, it also means a myriad of other innovative tools can use the data, though Google Transit is one of the best and most widespread thanks to its integration into Google Maps. Firstly, for now it’s timetable data, not realtime data. I’m told realtime is coming — GTFS has a realtime capability — but given at my local station they have trouble getting realtime train information from a display onto the platform relayed to the display outside on the street, I’m not holding my breath on that. Secondly, it’s not actually in Google yet. a GTFS feed isn’t the same as it actually being in Google. Google has to sort that out with the government, so that the data is slurped in, on a regular basis as things change. But the biggest barriers to that are now gone. Hopefully it’s not too far away, and the joy of easily planning trips using the World’s Best Journey Planning tools, currently available in every other state of Australia, is finally possible for us in Victoria. It’s only part of the puzzle of course. The trip the Journey Planner advises for A to B right now might be quite different an hour later, thanks to many routes being unpredictable, inconsistent, or infrequent. That makes things difficult for users to remember, and problematic if there are delays en route. A frequent, consistent, legible network will help with that. But that’s another story. As someone who travels a lot overseas, I’ve used Google Maps for transport frequently over the past few years. It’s been a revolution for travellers; previously in a foreign city it would only be practical to work out rail transport, as bus routes would just be too complex to understand for a short-term visitor. Suddenly, via the app, you can use the entire transport system – I remember catching my first bus in Montreal after a Google Maps search and being impressed how easy getting around had become. This’ll be a great benefit to both locals and visitirs once it’s activated for Melbourne. When we were recently in Sydney I used the websites Sydney Buses, Sydney Trains and the app Trip Go to plan, but what really came up trumps for me was Google Maps. After a couple of days, I gave up on the former as Google Maps was telling me all I needed to know and very simply. The PTV journey planner gives some strange results. When I enter “Parliament railway station” as an origin or destination it tells me this is ambiguous and suggests several variations, such as the bus stop next to Parliament railway station or the tram stop over the road from the station. Sometimes the actual railway station is not one of the options! Also the power of Google Now on Android phones (and it is installable on iOS) will help give instant information when necessary – I am looking forward to being able to turn up to the station, have my android wear watch vibrate and tell me when the next train leaves! Also will be a lot more useful once Real-time is activated, rather than using MetroNotify or whatever, again, it will be able to come up in Google Now (note, this is not futuristic stuff, other cities do it already). Thanks to this data, software developers can build great useful journey planners. For example, I am working on a country-wide version that connects all cities together. They insist on calling them “train stations” now. #enno That’s so commuters don’t get confused with cattle stations. Or Playstations. Anybody have an idea of the ETA for Google maps implementation? And the GTFS API implemented by PTV still doesn’t support all the features that they did support in EFA. I was a regular offi user. Easy and accurate door-to-door information. PTV has cut off access to it’s EFA interface so offi can’t provide Victorian network information any more. Have the PTV Journey Planner and it is a dog. Last 2 times I have used it I got complete bum steers and my journeys turned into disasters. Would have never happened with offi. My experience is that open data formats have the best outcomes and call upon PTV to restore access to their EFA interface.